The main difference between hepatic bile and gallbladder bile is that the hepatic bile is a bile that the liver produces whereas the gallbladder bile is the bile that the gallbladder stores. Furthermore, the concentration of the hepatic bile is low while the concentration of the gallbladder bile is high. Hepatic bile and gallbladder bile are two forms of bile in our body. They vary by their location. The liver produces bile and secretes it through the hepatic duct to the gallbladder. Subsequently, the gallbladder stores and concentrates bile, releasing it to the common bile duct through the cystic duct. Hepatic bile is a secretion of the liver. It is a dark green to yellowish-brown color fluid. The liver produces bile continuously, which flows out through the left and right hepatic ducts to the common bile duct. But, the release of this bile to the small intestine only occurs after eating. When food is not available in the digestive system, hepatic bile travels into the gallbladder for the storage. 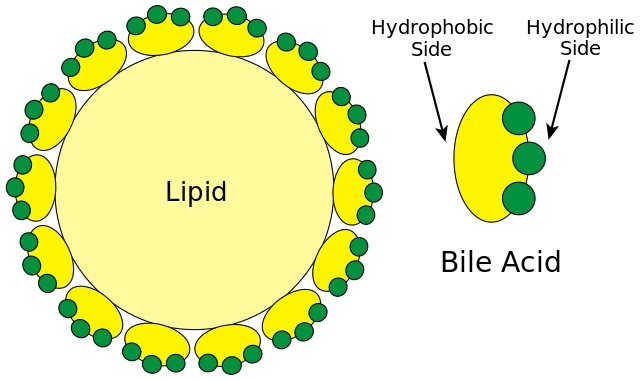 Bile is responsible for the emulsification of lipids, which aids the digestion. Hence, it serves as a surfactant. Bile salts are responsible for this and the anions of bile salts have both hydrophilic and hydrophobic ends. Thus, they aggregate around the lipid droplets, forming micelles. This increases the surface area for the enzymatic action of pancreatic lipase on lipids. In addition to the action in digestion, bile serves as a route of excretion for the endogenous and exogenous substances from the blood and liver including bilirubin, a by-product of the destruction of red blood cells. On the other hand, the bile in the common bile duct is alkaline (pH 7.50-8.05) and it neutralizes the acidic pH of the chyme. In addition, bile salts are bacteriocides, which destroy microorganisms in the food. Gallbladder bile is the storage form of the hepatic bile. The main function of the gallbladder is to store, concentrate, and acidify the hepatic bile. It releases bile to the common bile duct when food is available in the digestive system. After eating, the gallbladder releases bile to the common bile duct through the cystic duct. When hepatic bile enters the gallbladder, it is concentrated and acidified. The gallbladder bile contains 97% water, 0.7% bile salts, 0.2% bilirubin, 0.51% fats (cholesterol, fatty acids, and lecithin), and 200 mEq/l inorganic salts. The pH of the gallbladder bile is 6.80-7.65. Hepatic bile and gallbladder bile are two types of bile secreted into the common bile duct. The liver produces both types of bile. Also, both are secreted into the small intestine in the presence of food. Furthermore, the main function of these biles is to facilitate the digestion of fat through emulsification. The hepatic bile refers to the bile that the liver produces whereas the gallbladder bile refers to the bile that the gallbladder stores. 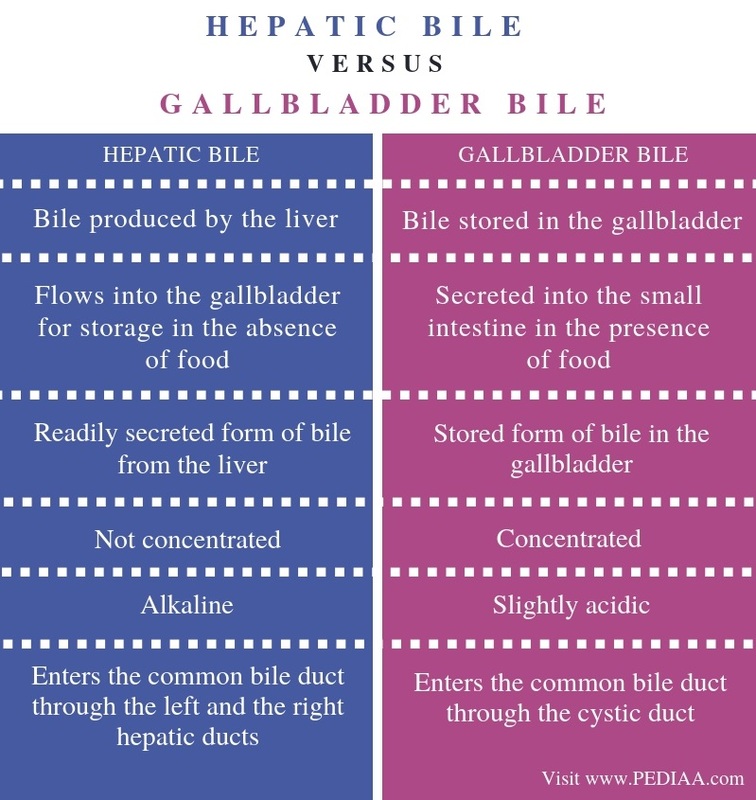 Hence, this is the basic difference between hepatic bile and gallbladder bile. Secondly, hepatic bile flows into the gallbladder for storage in the absence of food while both hepatic bile and gallbladder bile are secreted into the small intestine in the presence of food. Therefore, this is also an important difference between hepatic bile and gallbladder bile. Moreover, hepatic bile is the readily secreted form of bile from the liver while gallbladder bile is the stored form of bile in the gallbladder. Concentration is a major difference between hepatic bile and gallbladder bile. Hepatic bile is not concentrated while gallbladder bile is concentrated. Furthermore, hepatic bile is alkaline while gallbladder bile is slightly acidic. 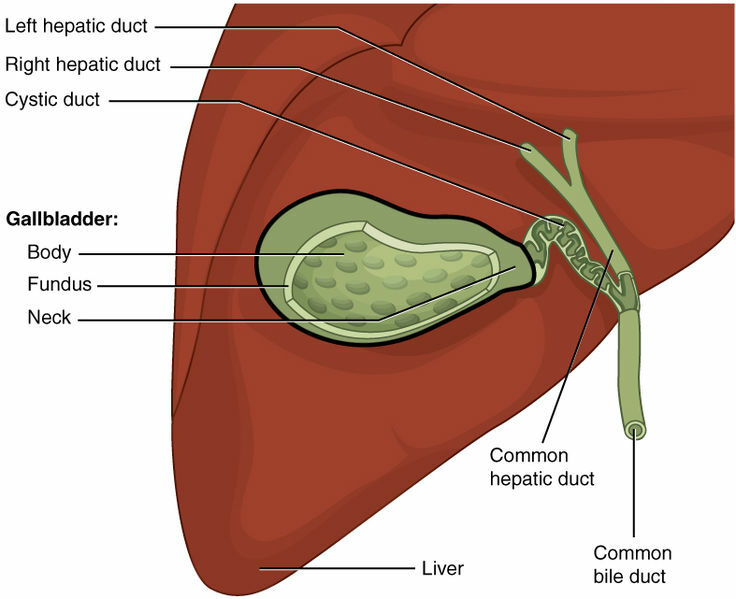 Hepatic bile enters the common bile duct through the left and the right hepatic ducts while gallbladder bile enters the common bile duct through the cystic duct. This is another difference between hepatic bile and gallbladder bile. Hepatic bile is produced in the liver and is secreted into the small intestine in the presence of food. However, in the absence of food in the digestive system, hepatic bile travels to the gallbladder for the storage. The main function of the gallbladder is to store, concentrate, and acidify bile. Therefore, gallbladder bile is more concentrated than hepatic bile. In conclusion, the main difference between hepatic bile and gallbladder bile is their concentration and storage.